Tasmania's world-famous Cradle Mountain-Lake St Clair National Park is carved up into two distinct sections. In the South, you'll find Lake St Clair at Derwent Bridge. 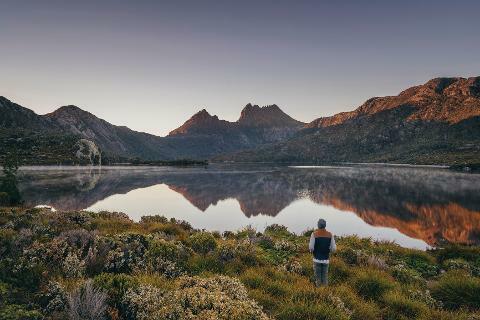 In the north, the stunning Cradle Mountain towers over reflective glacial lakes to create a breathtaking scene. There is no road that takes you between the two sections so you'll have to drive to the northern gate to find the beautiful Dove Lake Circuit. This is one of Tasmania's premier nature walks. The Trail circles Dove Lake while taking you beneath the craggy spires of the indomitable Cradle Mountain. This two-hour circuit is boardwalk for much of the way and is suitable for most which makes it a family-friendly adventure. The trail starts at the Dove Lake carpark on Road C132 in the northern reaches of Cradle Mountain-Lake St Clair National Park. The drive from Devonport, the north coast home of the Spirit of Tasmania ferry, takes only one hour and 32 minutes over 87 kilometres. Launceston sits 150 kilometres to the east with the drive takes a little more than two hours. The drive from Hobart takes you north before heading west and spans over 328 kilometres. That drive takes a little more than four hours to complete. This a flat walk takes place in the shadow of Cradle Mountain. The centrepiece of the Cradle Mountain-Lake St Clair National Park can look rather ominous when the weather is bad. But, when the weather is good, it's twin dolerite spires are majestic, powerful and inviting. The walking track takes you through an incredible mix of terrains. Scrubby buttongrass gives way to sandy lake beaches, cascading waterfalls and dense rainforests on this loop trail. Dove Lake itself is a rather beautiful scene especially when the wind is low. It's dark blue colors come from tea tree vegetation and buttongrass leaching into the water to give you an incredibly reflective surface. Get the angle right and you can take a picture of the lake and the snow-capped peaks around it. This flat trail has three standout areas -- Glacier Rock, Ballroom Forest and the Boatshed. This massive rock on the east coast of Dove Lake will educate you on the movements of glaciers. Look carefully at the rock to see striations that run parallel to the length of the lake. Rocky debris caught in these massive glaciers scraped across the rock as it carved out the basin for the lake. It's a wonder that the hard quartzite of Glacier Rock withstood such pressure. This cool temperate rainforest is filled with ancient Myrtle-Beech trees that are covered in moss. The rainforests floor is also covered in moss to give the whole scene a stunning cathedral effect. This rainforest is quite rare because these fire sensitive plants are usually burned away when bushfires sweep across the area. But somehow this incredibly beautiful patch of the rainforest has survived and is now waiting for you to discover. It's easy to sit here for a moment and picture mythical creatures lumbering around this magical landscape. You'll find this 1940-built shed on the northwest shores of Lake Dove. Built by the area's first Ranger, Lionell Connell, the shed was constructed mostly of King Billy Pine. Some restoration work was done in 1983 but the shed is mostly original. The now-vacant structure was commonly used until the 1960s. You can just imagine the majestic Huon Pine boats that used to ferry passengers around the lake in the 1930s. The boatshed provides the reference for a picture of the stunning natural surrounds. You'll find toilets at the Dove Lake carpark and the park's northern gate visitors centre. You can find picnic facilities at Ronnie Creek. Pets, firearms and bicycles are not allowed on the track. The weather at Cradle Mountain can change rapidly. While the loop track is not very long, it is best to pack warm clothing that is resistant to precipitation in case you get caught by bad weather away from the carpark. The boatshed can also provide emergency shelter. Do not attempt this walk if the boardwalk is covered in snow. Traction will be poor and parts of the trail will be impassable.